On Monday evening in London, while most people were winding down from a busy long day, over 100 people came together to step it up and do something quite different -- to be part of a circle of giving at a volunteer-run pay-it-forward restaurant, Karma Kitchen! 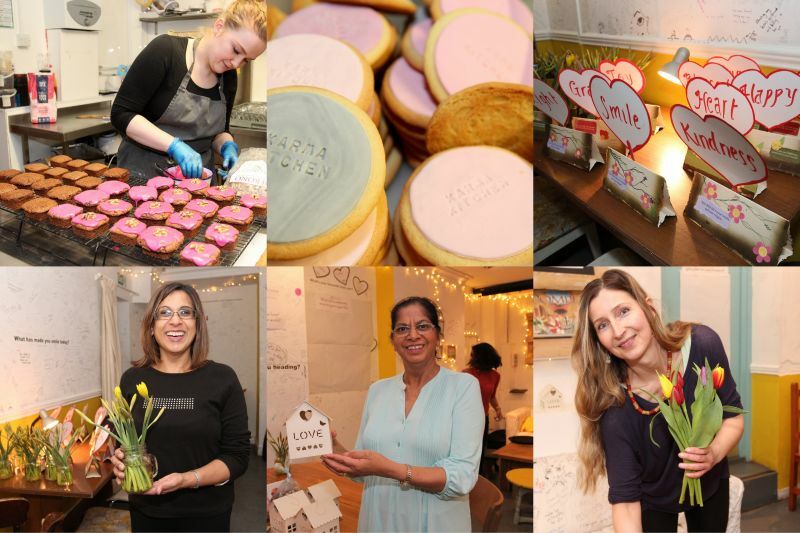 We hosted our second ever Karma Kitchen again on International Day of Happiness to share the Love with Londoners and it was an evening filled with abundant joy, inspiration, kindness, community and Love! Initially, we had almost double the number of volunteers sign up relative to diners -- something that's reflective of the ServiceSpace community around the world, as people are deeply moved to serve and give of themselves. 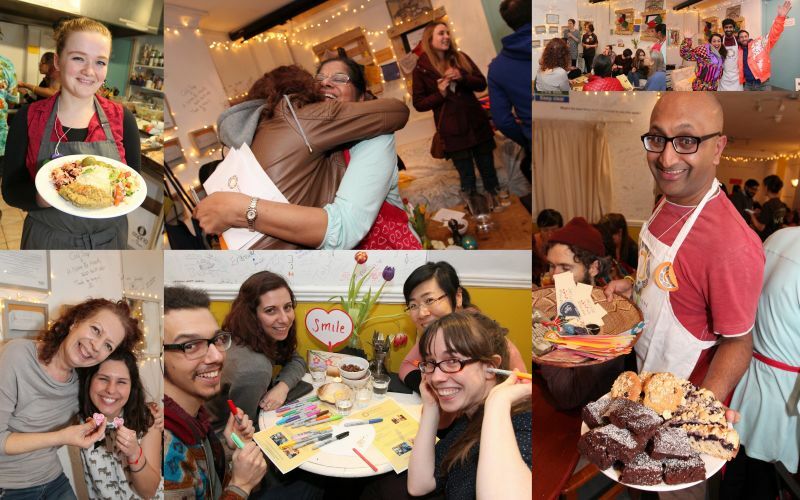 Several organisations that are friends of ServiceSpace, like Museum of Happiness, Wake Up London and Action for Happiness, got involved by spreading the word and before we knew it, not only did we have double the number of volunteers registered then were needed, but we also had two fully booked dinner sittings with long waiting lists for both! It's beautiful to see again and again how simply holding space with unconditional generosity at the centre can move so many different people from all walks of life to tap into the fundamental generosity in their own hearts and inspire them to serve and give of themselves. As we arrived at the Canvas Cafe to set-up, we followed the trail of amazing aromas leading to the kitchen where we were met with big smiles, as we introduced ourselves and met each of our five volunteer cooks! They had come together to prepare a meal with love for guests at Karma Kitchen and they said it was such a wonderful experience just being together to cook and serve others in this way! We were blown away by their generosity and the genuine love they added into every part of the cooking process. As volunteers put their hands, head and hearts together, in just a couple of hours they transformed the atmosphere in the basement with so much love, Karma Kitchen style, or as Ruth later described during our closing circle -- they made the room look and feel so magical :) Quotes, fresh flowers and heart-shaped name signs appeared on each table, rangolis made with rose petals adorned small spaces, inspiring quotes were sprinkled around on the walls and gifts overflowed in baskets waiting to be shared with guests. It's always beautiful to see how things flow so beautifully when everyone involved shares the same intention -- to cultivate generosity in their hearts, moment by moment. Following a circle of sharing where all the volunteers reflected on their intentions for the evening, we were ready to open the doors and welcome our first guests to Karma Kitchen! By the time we were ready to welcome guests for the second sitting, the volunteer team was feeling even more settled into the flow and ready as ever to serve with love. Esteban offered his signature hugs as he got all the guests checked in while we turned the space around for the next set of guests. I had a chance to welcome them all to the space with warm hugs together with our joyful team of servers. As kitchen team members became servers and servers went to the kitchen to plate up and wash dishes with love, everyone chipped in to fill gaps and help each other out as needed. It always amazes me how this happens so effortlessly in a place where service is at the heart of everyone's collective intentions. During both sittings, our dish washing volunteers took a break from their duties :) to come out and share several beautiful reflections that our guests had written about the evening's theme "How can we be the love we wish to see in the world?" One of the highlights of the second sitting was a musical offering by Joe Holtaway, a friend we know from the Wake Up London community, who blessed the evening with his beautiful singing and guitar accompaniment. He engaged the whole room in singing the chorus of his first song, which drew everyone together so beautifully. When he asked if everyone wanted to hear another one, a joyful cheer erupted for more of Joe's inspiring music and so he shared one more beautiful piece. Later, during our closing circle, one of the volunteers even shared that Joe's musical offering was the highlight for him of the entire evening! We hope you enjoy this collection of photos from the day -- Highlights of Karma Kitchen London - March 2017. We look forward to collectively welcoming Londoners back to experience generosity on the menu at Karma Kitchen again in the near future!